Picture This: An Adventure Guide to the Gallery. Our performance was based on the use of our adventure guide to the gallery and so the performance required slightly different framing. 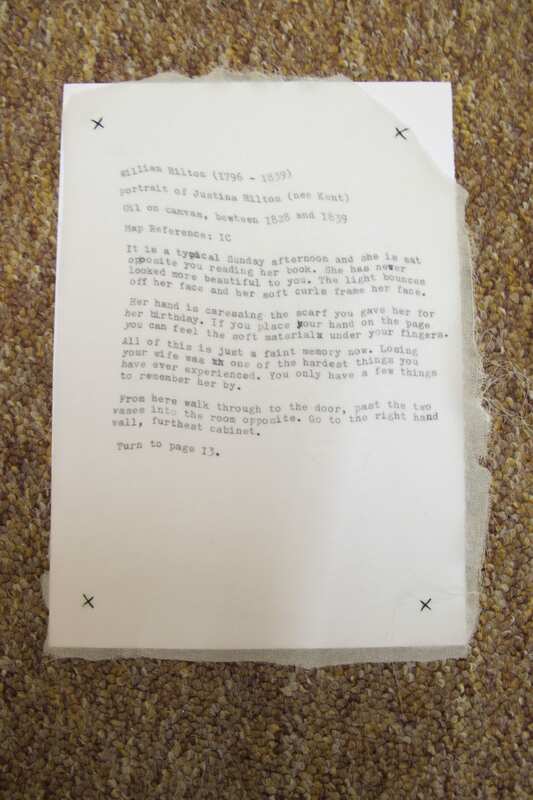 The object itself, the book, provided framing for the performance so a brief statement was included as an introduction, in order to explain the premise of the book and the influences. The length of time was determined by the reader of the book as the audience could choose how many narratives they took part in, and the length of time they spent looking at the works. In this misguide adventure book, we are interested in making the audience or reader the lead role in a narrative that lets them interact and understand the work in new ways. We invite you to engage with the work, providing texture and tasks alongside facts and fiction. You get to engage with the tasks and follow your own route through the Usher. Practitioners and artists we have taken inspiration from are Wrights and Sites; the use of work from various authors and taking inspiration from Grayson Perry. Our thematic concern was to emulate a conceptual collage of ideas, routes, stories and experiences that are not usually part of the gallery experience. Welcome, and let’s get this adventure started. My initial thoughts were that site specific performance was self-explanatory; that it was a performance that was situated in a specific site. After reading around the subject I discovered the site specific performance is not “simply occupying an ‘unusual setting’” (Pearson, 2010) but instead, according to Gay McAuley “engages intensively with the history and politics of that place, and with the resonance of these in the present” (Pearson, 2010). For me, McAuley’s definition highlights a key aspect of site specific performance. The location is part of the performance, not just physically, but it’s history and what it has or does stand for all contribute to the reading of the performance; it is more than simply the place that “contains the performance” (Pearson, 2010). For research I felt one of the most important things I could do was experience galleries. Even though our performance was designed to be specific to the Usher gallery, I felt that it was important to experienced different galleries to see if they could inspire me to look at the Usher, or its works, in a different way. I was fortunate enough to experience a performance in a gallery during my reading week. At the Henry Moore Institute in Leeds there has been ongoing exhibition The Events Sculpture which “presents nine sculptures that are events” (Henry Moore Institute, 2014). The exhibition is asking “how transitory sculptures can be written into art history” (Henry Moore Institute, 2014). One of the nine pieces I was able to experience was a re-performance of Tino Sehgal’s Kiss, 2007. The couple were able to create intimacy and sexual chemistry with “No sighing, gasping, heavy breathing, or any other sounds of pleasure” (Gratza, 2015) but with their movements between each other. This was a valuable experience for me, as although it was not site specific, it was a performance in a gallery based on art. This performance experience was early on in the devising process and so this piece did not out rightly impact my piece however it did help with my understanding of performance. Grayson Perry has been influential in my group’s development. The key element we took was his idea of taking a classic form, and modernising it. This led myself and my group to the development of an adventure guide to the gallery. A misguide that created narratives and stories instead of presenting false-truths and mythogeography as truth. I have been fortunate enough to encounter a wider range of Perry’s work including visiting his exhibition at the National Portrait Gallery called Who are you? 2014. In this exhibition Perry has created fourteen portraits that “are not primarily concerned with what the subjects look like” (Perry, 2014) and instead are an insight into “the narratives of people’s lives” (Perry, 2014). This is what we wanted the book to be. We wanted to create narratives and stories that meant the reader were provided with new insights to the work, potentially insights they had not considered before. Wrights and Sites is a company of four artistic researchers “whose work focused on peoples’ relationships to places, cities, landscapes and walking” (Wrights and Sites, 2012). The aim of their work is for people to “read into it and connect from it” (Wrights and Sites, 2012). The element of Wrights and Sites work we investigated for my group’s site specific performance was A Mis-Guide to Anywhere in which they created a book about a city. A Mis-Guide to Anywhere, 2006, allowed the users to create their own “exploratory journeys in whatever environment they choose” (Wrights and Sites, 2008). This is the key element that myself, and my group, were keen to unpack and develop for our misguide work. We wanted people to create their own experiences and not just be led around the gallery being told information. The creation of an adventure book, similar to that of those read by children, means that the reader/audience can go on an adventure in the gallery. With a story based on the artwork and choices for where the narrative will lead means that we hope to give the reader/audience a more personal experience of the gallery. 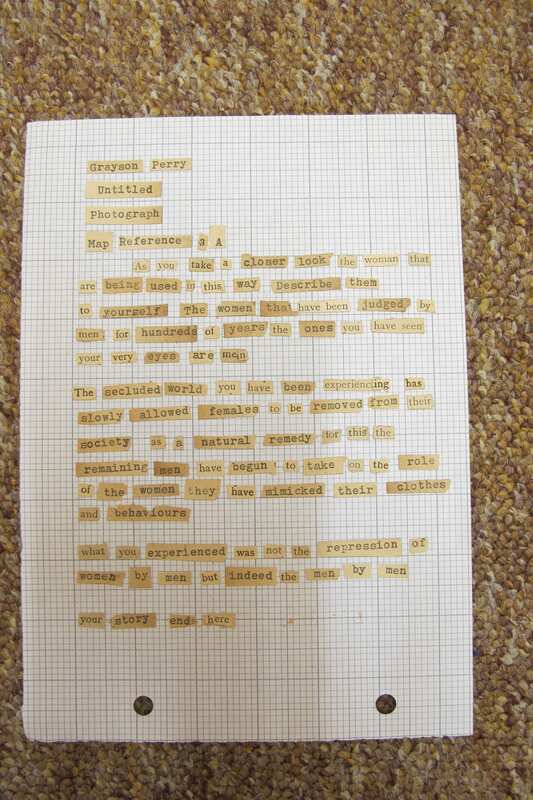 After a few weeks of experimenting with performance at the gallery, including writing performance text and peeling potatoes, we were asked to think about what we wanted to perform. I initially, wanted to look at the patterns of behaviour at the gallery. From my own behaviour and observing other people, I discovered that people move from one picture to another, and don’t often engage with the work. They are quiet and polite, and rarely get physically or vocally excited by the work. Garoian posed the question “How do we differentiate between looking at a work of art and seeing it?” (Garoian, 2001, 239) and this statement became influential in focusing our work. After looking into the work of Wrights and Sites and following a lesson exploring different forms of documentation; we became focused on the idea of a choose-your-own adventure book, as a misguide to the gallery. A book created by Tim Etchells, which had a cardboard cover, prompted us to think about a physical object we could create as a means of guiding the public around the gallery. 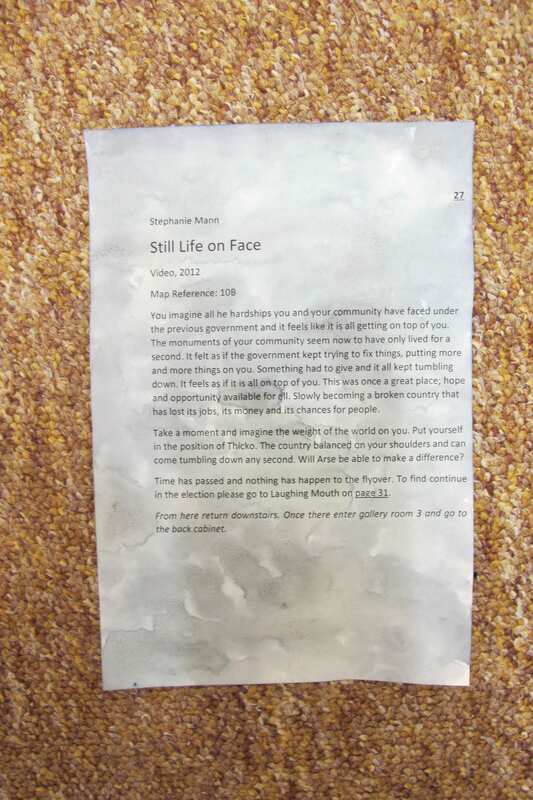 “It is in the context of the museum, gallery, and art market that performance appears to primarily offer disappearance” (Schneider, 2012, 66) is an idea that Schneider presents, however, myself and my group were hoping to create a lasting product that would not ‘disappear’. Our next task was “accumulating material, finding unexpected connections” (Mitchell, Saner et el. 2002) between the works of art. 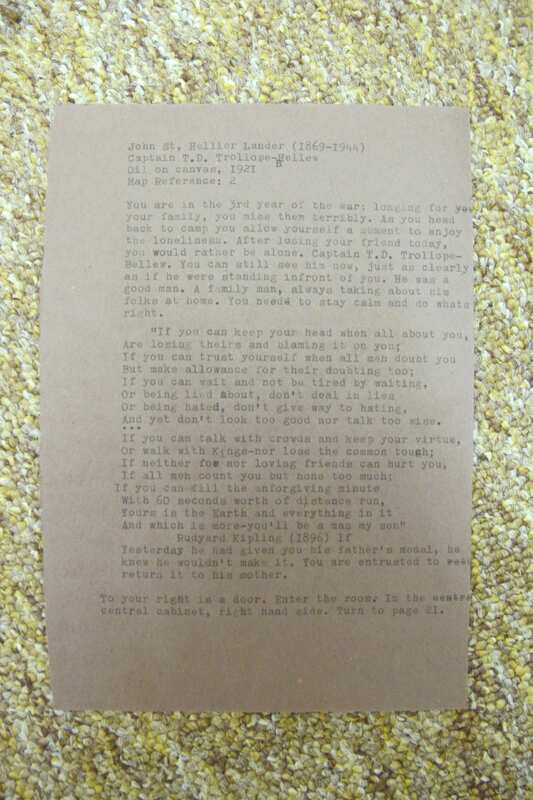 In Letter to a Young Practitioner it tells you to avoid “what seems important to you” (Mitchell, Saner et el. 2002) but instead develop where there are already connections and this is something we hoped to achieve. We allowed ourselves to “drift” (Wrights and Sites, 2011, 9) a notion presented by Crabman and Signpost in A Sardine Street Box of Tricks, which was a “destination-less exploratory walk” (Wrights and Sites, 2011, 9). We used this to choose the pieces of work we wanted to bring together into a story. We collaborated on two of the narratives, taking two or three works each and then we went on to develop our own narratives. Once we had created our narratives, the most important aspect to develop was the directions between works of art. When we tested a narrative on our classmates we discovered that we need clearer directions and potentially the inclusion of a map. We took these comments and did exactly as they said. We drew up a map, which numbered the rooms and gave the walls a letter. This provided a map reference to include in the guide to help visitors who were lost. This development aided the use of the books, making them clearer and easier to use, not an artistic choice but practicality choice. It was also suggested to us that in order to ensure the book is in-keeping with the gallery, we should develop some hand-made elements to the pages. We wanted to “develop more animated and less rigid modes of delivery” (Bennett, 2012, 4) and so this meant making the pages different and unique. Some of the methods I used to make my pages interesting included: the narrative written in French, typewriting onto paper and material, and collaging from an old book. We also bound the book with twine and created covers out of cardboard; the cardboard covers was a feature from Tim Etchells’ book that we found most interesting. The day before our final performance we decided to have a dress run of the book. We stood in the first gallery room, where we would be standing on the day of the performance, and tried asking members of the public to engage with the book. We hoped this we be one final test before the day of the performance, to smooth out any final mistakes. We were successful in getting members of our class to engage with the work but sadly the public were less responsive. People were dismissive and were not interested in taking part. This was a disappointment for us, we were hoping that the public would be more interested than they were. From this we decided to try to be friendlier and clearer in our explanation. We were able to streamline our front of house performance, so that it was better for the final performance. For the final performance we split ourselves between the entrance, the ground floor and first floor where we worked on shifts of approximately forty minutes, so that we each experienced Front of House and assisting around the works. We provided the audience with a book, map and a pencil so that they could take part in the tasks we had created as a means of documentation. The books proved to be popular, as while I was on Front of House we had all six books in use on three occasions; all by groups of people, not just individuals. As the books were returned I received a lot of positive feedback about the books and it seemed a common theme was that people enjoyed experiencing the art in an unusual way, instead of just looking at a work and moving on. This meant that the books had been a success as we hoped people would engage with the work in new ways. Sadly this was not reflected in our documentation. For approximately the first hour we only received one completed task and myself and my group were concerned about the amount of documentation we would receive in total. Considering the popularity of the books we only received six dog tags, five ballot papers, five sketches, three postcards and one whistle. I had hoped for more documentation as, I don’t think, the information we have reflects the narratives chosen by the public. I found it interesting that the dog tags and whistle were both in the same narrative, and yet differed in number. Potentially people were afraid to vocally engage with the work in a public setting, although I do not know the definite reason for this I can speculate embarrassment or politeness. I feel the strengths of the performance include: the hand-made pages of the book, our presence as guides and assistants and the interesting narratives. Firstly the hand-made pages I feel were a success as they added texture and quality to the book. It meant that the book was also in-keeping with the gallery as it became a piece of art in itself. Secondly being present at the gallery as a guide was successful because I feel the opportunity to interact with the people reading our guide worked in favour of the book. The book potentially work without our presence, they could be collected and returned to reception along with the tasks but I feel being able to give the book to each group made it more of a personal experience. It also allowed for queries and questions to be asked of myself and my group whilst the books were in use. Lastly the narratives themselves were a success; they were interesting and engaged people. Many people commented on how they thought the books were interesting and a good idea. I feel that the popularity of the books proves the narratives to be a success as they were constantly in circulation. The weaknesses, however, include the directions between works, the distance you have to travel between pieces of art and engagement with the tasks. To begin with, the directions we provided were trialled multiple times however they still proved to cause confusion, despite the inclusion of a map. I frequently found that people who had visited the Usher before were able to understand the directions and map much easier than those who had not. It seems that despite all the work we put into our narratives’ directions they were still difficult to follow. The distance between artworks was a problem I found with people who came to the gallery with the intention of browsing the work; not taking part in site specific works. Another group of people it was a struggle for was the elderly, who told me they had struggled going up and down the stairs a lot in a short period of time. This weakness meant they only wanted to engage with one narrative. As I explained in ‘Audience’ myself and my group were hoping for more task engagement and this was potentially low because we were asking people to engage in activities that they felt uncomfortable doing. For example, whistling was far lower than the named dog tags. This may be because they felt uncomfortable whistling in a public place, or because they were being polite to other visitors. Similarly the ballot papers were more popular than writing a postcard, which may imply that the less time consuming tasks were more popular. It is these weaknesses that we have been able to create improvements. For the final performance the first improvement I would make is making the books available for longer in the Usher. I felt that the longer we spent in the gallery, the more confident we became as a group and I felt as if I were able to converse better with people. Another improvement I would make to the final performance is to change the greeting at the door. Although I think I was polite, friendly and clear at explaining, I felt it needed a more personal approach. It felt too rehearsed and that each explanation could have been personalised to each group walking in. Improvements I would make, if I were to perform it again, would be firstly change the narratives. I do not think that there was anything wrong with the narratives, but to address the weakness I stated of travelling between floors. To improve the book for use in the gallery I would devise a narrative per room so that the public can travel between each story with ease. Similarly, although there was nothing wrong with the method of binding the book, I think the book would be improved by looser biding to make it easier to open, close and read. How has my understanding of performance advanced through working in a non-traditional venue? I think that the most important thing I have learnt from working in a non-traditional venue is “focusing upon process rather than object” (Pearson, 2010). When working in a traditional theatre setting the focus is always on the end product usually the production at the end. It has been both interesting and exciting to create work where the development has been as important as the end product, in my case the trial and error of narrative writing has been as important as creating the finished book. I also learnt that you should not attempt to “create characters that operate as if they are in a naturalistic drama” (Wrights and Sites, 2011). Performance is not about being a character but instead telling the audience something, whatever the method of ‘telling’ is. Bennett, S. (2012) Introduction in Theatre and Museums. Basingstoke: Palgrave Macmillan. Beresford, K. (2015) From Personal Album. [Taken] 07 May 2015. Garoian, C, R. (2001) Performing the Museum. Studies in Art Education. 42. (Spring) 234 – 248. Gratza, A. (2015) Event Sculpture 7: Tino Sehgal, ‘Kiss’ (2002). [online] Leeds: Henry Moore Institute. Available from http://www.henry-moore.org/hmi/online-papers/the-event-sculpture/event-sculpture-7-tino-sehgal [Accessed 2 February 2015]. Henry Moore Institute (2014) The Events Sculpture 10 November 2014 – 8 March 2015. Leeds: Henry Moore Institute. Kotsopoulou, F. (2015) Site Specific (The Collection and Usher Gallery). Available From https://www.flickr.com/photos/61839232@N02/17533660582/in/album-72157652241721658/ [Accessed 15 05 2015]. Mitchell, C. Saner, B. Christopher, K. Jeffrey, M. Goulish, M. Hixson, L. (2002) Letter to a Young Practitioner. [online]. Goat Island. Available from: http://www.goatislandperformance.org/writing_L2YP.htm [Accessed 15 15 2015]. Pearson, M. (2010) Introduction in Site Specific Performance. Basingstoke: Palgrave Macmillan. Perry, G. (2014) Who are you? [online] London: National Portrait Gallery. Available from http://www.npg.org.uk/whatson/graysonperry/display/who-are-you.php [Accessed 14 April 2015]. Schneider, R. (2012) Performance Remains Again. In: Gabriella Giannachi, Nick Kaye and Michael Shanks (ed.) Archaeologies of Presence. London: Routledge, 64-81. Wrights and Sites (2008) A Mis-Guide to Anywhere. [online] Wrights and Sites. Available from http://www.mis-guide.com/ws/archive/mganywhere.html [Accessed 17 April 2015]. Wrights and Sites. (2011) A Sardine Street Box of Tricks. Exeter: Blurb. Wrights and Sites. (2012) About [online] Wrights and Sites. Available from http://www.mis-guide.com/ws/about.html [Accessed 17 April 2015].